It’s a much-maligned feature of an oft-derided series, but Star Trek: Enterprise‘s pop song intro is perhaps overlooked as a unique and telling moment in Trek history. I’m not necessarily defending it. However, on the tenth anniversary (Sept. 25) of the original broadcast of Enterprise‘s debut episode, “Broken Bow: Part 1,” I thought it might be time to reflect again on this controversial choice. While time has not necessarily vindicated this decision for many fans, in my view, it ultimately communicates something important about Star Trek. When Star Trek: Enterprise (then known only as Enterprise) premiered on UPN in 2001, it broke with longstanding Trek tradition by eschewing an original orchestral score for its opening title sequence in favor of a pop song – specifically, “Where My Heart Will Take Me (Faith of the Heart),” performed by Russell Watson. It’s a reworked version of the Diane Warren-penned “Faith of the Heart,” a song originally recorded by Rod Stewart for the soundtrack to the 1998 film Patch Adams. Yes, Star Trek used a Patch Adams song. Like many of you, I was there that fateful day, waiting in rapt anticipation of the opening strains of a brand new Star Trek theme. And then, this happened. Shock. Dismay. Disbelief. Maybe a twinge of indigestion. To be fair, some would say that about Pegg’s own Trek film. Not me. Just some people. You know who you are. And after all, let’s be honest. Neither of these moments is the most hideous in Star Trek history. This is. And now the confession. While I still have some reservations, ten years on, I have to say I’ve softened toward “Where My Heart Will Take Me.” Yes, it’s a bit schmaltzy. It’s cliche-riddled. It’s way too radio-friendly for my listening taste. And it’s (most unfortunately) not by Jerry Goldsmith. But really, it’s not that bad. And honestly, I think it’s important. Aside from Russell Watson’s smoky-clean tenor voice, I’ve always liked the overall concept and execution of the title sequence itself. By placing the starship Enterprisewithin the context of the history of aviation and space flight, it casts the Trek universe as a future to which we have a very definite and concrete connection. It’s a fuller expression of a beautiful idea alluded to in Star Trek: The Motion Picture. In the film, the progression of ships called Enterprise throughout human history is captured in framed pictures on a wall inside the refitted NCC-1701, with a tip of the hat to NASA’s first space shuttle, which had recently been christened with the legendary moniker in honor of Star Trek, again recognizing Trek’s real world connections. This reinforces the idea that Star Trek portrays an achievable future and therefore reinforces the idea that humans can change for the better. So, in that sense, I feel like the Enterprise title sequence has both an emotional and thematic progression that I like very much. But my recent rethinking of my feelings about this fan-infuriating prelude has more to do with the theme song itself. “Where My Heart Will Take Me” is filled with pop song cliches, but in a package that, in the context of Star Trek, becomes more appropriate and meaningful. 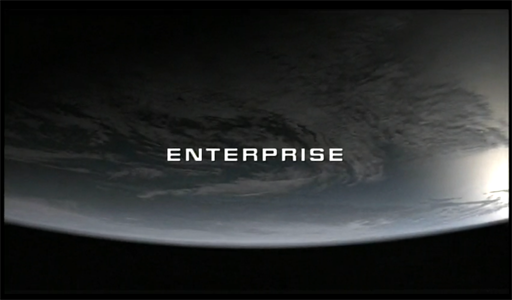 Enterprise‘s goal as a series seems to have been to come back to the origins of the Trek universe in order to re-establish the motives and goals of the franchise. By showing us how we got to Kirk and Spock and NCC-1701, Enterprise sought to realignStar Trek with its fundamentals while telling new stories with new characters in a different time. With this concept of bringing us to the beginning of things, it seems that the opening title sequence was a moment in which we were meant to reflect upon all that Star Trek means. It’s presented as if to say, “Star Trek has come a long way and this is what Star Trek is all about.” If that’s true, then the choice of song here is very significant. First, the song chosen is contemporary to our time. This is a very bold choice that again speaks to the idea of tying our current world to the Trek world (much the way Steppenwolf’s’ “Magic Carpet Ride” and Roy Orbison’s “Oobie Doobie” had done in Star Trek: First Contact). Secondly, the song has lyrics – a major departure in itself, no matter what era the song comes from. This is a Star Trek theme that has something very specific to tell us. It’s been a long time, but my time is finally near. Cause I’ve got faith of the heart. I’ve got faith to believe I can do anything. These lyrics are significant in a number of ways. First, the song is all about following your heart, that time-worn chestnut of pop music and movie advice. As a Christian, I have long been encouraged to disapprove of and reject popular admonitions to “follow your heart.” But the truth is, as a human being, I am indeed guided by my heart – my loves and my desires. There’s no way around it. Consider these words from St. Augustine on the matter of the human heart. In other words, our hearts, our passions and desires, drive our decisions and our lives. They must be engaged somewhere in order for our lives to find purpose. In that sense, a focus on the heart and its leading is very much in harmony both with with the Christian life and with some essential human truths upon which Star Trek is based. The journey out into the stars in Star Trek is really an exploration of the human condition and the human heart. The quest of the Enterprise, along with her sister ships and space stations, is a progression toward a better, fuller, truer humanity. I would contend, along with Augustine, that the fullest, best expression of our humanity is one that finds its goal, purpose and meaning in the God by whom and for whom our human nature was created. Consider Augustine’s words again. That restless heart is the one that drives the journey of discovery in Star Trek. It is therefore no accident, I believe, that many of the things we find along the way within the series are congruent with what Scripture tells us about what it means to be human. Our hearts drive us. We must follow them, for there is no other engine for the human soul. The question then becomes: Is Christ the Lord of my heart? Does God ignite my desires? In his book, Reordered Love, Reordered Lives, my good friend and colleague Dr. David K. Naugle posits that it is the disordering of our loves that has disordered our lives and that it is at the heart level at which change must occur in order for things to be set right. Star Trek echos this idea, constantly drawing attention to the inward struggle of its characters, where the real victory must be won. The inner human is the true human. The heart, the soul are what make us who we are. As Data says in the classic Next Generation episode “Data’s Day,” being human is “more than simply a matter of being born flesh and blood,” and is instead “a way of thinking, acting and feeling.” Similarly, in Star Trek II: The Wrath of Kahn, Spock’s half-human DNA aside, it is the Vulcan’s soul that Kirk describes as the “most human” he has ever encountered. They had Faith of the Heart. Indeed, “Where My Heart Will Take Me” refers to “strength of the soul.” The song is all about the inner human, the interior life, even as the accompanying images tell of our outward accomplishments. It’s a clear statement of the underlying theme in Star Trekthat all our technology and how we use it is an outgrowth of the condition and goals of our hearts. We are not merely seeking new lifeforms in the stars; we are seeking new life, new growth, for the human soul. Secondly, the lyrics reflect the literal journey to the stars, the progress of humankind through the infancy of aviation technology to the realization of interstellar travel. “It’s been a long road,” Warren writes, which becomes a reflection of the centuries it has taken humankind to achieve this goal. Similarly, when the song speaks of touching the sky and reaching “any star,” it can be taken quite literally in the context of Star Trek. When we hear the words, “they’re not gonna hold me down no more,” they can be referring to the force of gravity and the speed of light, things that had heretofore stood in the way of such technology, not to mention the voices that said such things could not be done. At the same time, because of the song’s focus on the interior life, these lyrics demonstrate again that these are not mere technological achievements, but expressions of deep human desires and longings. It is those deep longings in the human heart that the gospel directly addresses, giving aim, purpose and goal to our desire to reach for things that are higher and greater than ourselves. Thirdly, and perhaps most intriguingly, it is interesting to note the constant theme of the lyrics represented by the song’s original title, “Faith of the Heart.” This lyric, and for that matter the song itself, is important because it very correctly locates the central ideas of Star Trek in the realm of faith. Ultimately, Star Trek is about faith. This is certainly not faith in Christ or indeed any form of intentionally religious faith, but it is faith nonetheless. And since Star Trek is all about what it means to be human and what we need to improve and become the best human beings we can be, it is not insignificant that, in this moment, Star Trek pauses reflectively to say, “What we really need to be better humans, what really lives at the core of our humanity, is faith.” I find the expression of this idea fascinating, as it comes from a series that is generally meant to reject belief in most things that are considered supernatural and most areas of life (religion, spirituality) where faith is regularly engaged. Does faith really have a place in science fiction? Faith is not about empirical knowledge and concrete definitions. It does not reflect the idea so many have of science as the place of the known. Faith is, as Paul says, “the evidence of things hoped for and the substance of things not seen.” It is a thing of mystery, of the unknown. Faith is a step into the dark in the abiding hope that we will find the light. Certainly Star Trek‘s faith is in the human spirit, with no “outside help” from God. But, if our humanity was created as it is by God in order that we would be drawn to him, and if faith is an essential element of that relationship, I find it interesting that evenStar Trek must recognize that faith is a core component of our human nature. Faith is indeed part of what makes us human – not just a faith that the ground will not collapse under our next step, but faith that we are part of something that is greater than ourselves and that our identity as humans is defined by something more than our mere biology. These are the building blocks for understanding the idea of the soul and the God who created it. So, while “Where My Heart Will Take Me” will always remain controversial among fans, for me it will always also express some deep truths about humankind and our relationship with God. It tells me that our hearts define our actions and lives and that if we are to follow them, they must be properly oriented. It tells me that the works of our hands are an outgrowth of the condition of our hearts and that the work we do is an essential element and expression of our humanity. It tells me that faith is a core component of our humanity, that we are believing beings because there is something out there to be believed in, that we are created as curious creatures in order that we would be drawn to our Creator. And it tells me that when we quest, as Star Trek does, for the deepest understanding of what it means to be human, we will stumble upon these truths that point us to God, even when we’re not looking for Him. So, a Happy Anniversary to Star Trek: Enterprise. May the series and its infamous theme song cause us to stop and ask where our hearts are taking us and how we might orient them toward places we were made to go. “Blood Sweat and Tears’ Magic Carpet Ride”?? Zephraim Cochran would not be caught dead listening to BST. That’s Steppenwolf, man. Oh, I am so dense sometimes. How did I even do that?? Thank you. Totally fixed it. Yeah, as a Christian especially I would have thought your opinion would have been more favorable towards this song, because its lyrics are indeed quite spiritual and uplifting…. There’s no accounting for musical taste I suppose. I guess you must be a fan of some sort of alternative or underground music, or perhaps just classical music, and thus a pop song with its roots in the power ballads of the 70s and 80s would not appeal to you…I myself am a fan of classic rock bands like Boston, Journey, REO Speedwagon, Chicago and Bon Jovi; therefore I think it’s a great and beautiful song, and I’ve never understood the antipathy towards it by many other Star Trek fans. But to each his own. As I said on Twitter, some people are just really hostile towards change…which I think may account for a great deal of the hostility towards the Enterprise theme among Star Trek fans. I completely agree about the hostility toward change. I think that’s true of many people who say Abrams ruined Star Trek or Braga ruined Star Trek or Berman ruined Star Trek, etc., etc. Change is not accepted very well by certain fans. For what it is (a fairly predictable, radio-friendly pop song), “Where My Heart Will Take Me” is a good song. It’s well-structured, even if we’ve heard that structure many, many times over. I think the first of the two versions used for Enterprise is the best musical arrangement of the song I’ve heard. But, as power ballads go, it feels a little sappy to me, even though I enjoy a good power ballad. I think it’s actually the lyrics that annoy me the most. It’s cliche after cliche, recycled lyric after recycled lyric. It’s just that in this context, this particular collection of these specific cliches ends up saying some interesting and, I think, quite compelling things about Star Trek and therefore about humanity. Without the Trek context, I doubt I’d find the song terribly inspiring. But I’m glad others do. The truth is, the song speaks to many people on its own, which is good and may be why the response I’m getting on Twitter and Facebook about the song has so far been overwhelmingly positive. I recall initially disliking the song, but having it grow on me as sort of a dopey guilty pleasure. Change takes getting used to, and it was a definite tonal shift. But I got used to it. I do however take issue with the notion that the only reason anyone would dislike the Abrams movie is because of a knee-jerk resistance to change. The movie was so littered with inconsistency (e.g. Nero and his crew diddling around for 25 years after arriving in the past), character assassination (e.g. Spock doing it with his student Uhura while still in a position of authority over her), and world-breaking story contrivances (e.g. if we can beam across interstellar distances, why have starships? If an insubordinate twerp can be promoted from Junior Cadet to Captain in an eyeblink, why have Starfleet? ), that the entire experience sank under the weight of its own lovely, vacuous stupidity. I don’t hate it because it’s different. Every series has been different in key ways from the previous. I hate the new movie because it’s *stupid*, and that’s something Star Trek never used to be. I would never mean to imply that the only reason someone wouldn’t like the Abrams movie was a reaction to change. I know people have specific issues with the film. I see Star Trek as constantly riddled with inconsistencies and contrivances anyway (despite a large swath of good, consistent universe-building) so, some of the things you and mention just sound like new ways of making the same old leaps of logic and errors. Some of what people have issue with is a conscious and intentional departure from the way things were done in the past. I don’t have so much of a problem with either because I loved the story, the characters (re-imagined), the philosophical statements, the beautiful effects and how darn much fun it was. The other stuff, like most changes we make in life, is simply exchanging one set of complications (and shortcomings) for another. That’s how I see it, anyway. As far as Spock/Uhura being character assassination, I think it could just be a youthful “mistake” on the part of this developinng Spock that gives good reason for him to brush Uhura off in TOS – repentance for an error in judgement.